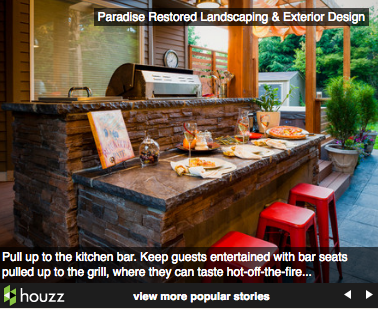 While perusing the Houzz home design and improvement website today, I caught a nice article about outdoor kitchens written by Houzz contributor Laura Gaskill. She really had some neat ideas to help create the outdoor kitchen of your dreams. Of course I would emphatically add that installing a wood burning parrilla grill system would be the crowning touch on your perfect outdoor kitchen area. Fortunately, we offer a full line of grills and grill inserts to help you find the perfect one for your cooking space. Check out the article and see what you think. Be sure to view the comments for more great ideas and to let us know what you think are some great ways to create an outdoor kitchen space.